It began with a toothache when Golsom was thirteen years old, and developed into an upper jaw infection. 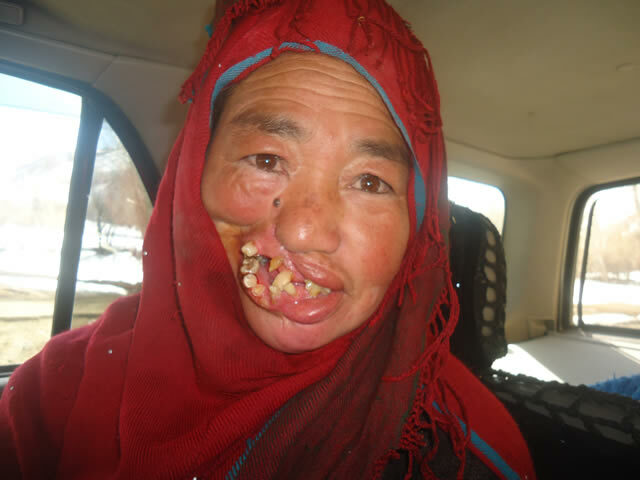 Her village in Bamiyan province lacked any dentist or health facility, so her family just prayed for her. But it was not enough. She spent three months in bed without any treatment, and was left with a severe facial malformation. After that, Golsom’s neighbors behaved differently towards her. People laughed and made jokes about her. She would never show her misshapen face, always hiding it with a scarf. When she was fifteen years old, her father became seriously ill and believed that Golsom needed some kind of a husband to support her after his death, so he forced her to marry a boy who had his own disabilities. Golsom started married life with new problems. Not only was her husband deaf and mute, but he had a mental health condition. He was very disturbed and often beat her. After a year, Golsom became pregnant and had her first son. Now her responsibilities increased because she had to find food and clothes for the child. Nobody helped Golsom care for her son. Ignorant people thought she was not a good woman because she had a misshapen, distorted face. After thirteen years of marriage and two more children, and during a time of insecurity and fighting near their home, Golsom and her husband fled their home. But in the process, her husband fell from a mountain and died. Now with three sons to look after, and no family or economic support, Golsom’s problems increased. I was introduced to Golsom by social workers and I was impressed by her courage. She is a mighty woman who has raised her sons, faced discrimination, and solved her economic problems alone. Today, forty years old, she lives in small village in Bamiyan and works hard as a farmer. But she still cannot participate in society because of her malformation. Maybe if she were a man, she could sell her field and have cosmetic surgery. But Golsom does not own the land she works because in Afghanistan, most women are deprived of property rights. Golsom has always wanted an operation for her face. The women of Bamiyan decided it was important to help her, and we began a campaign. But as we are poor and have our own economic problems we could only raise $500, which is not enough for the operation. Now we wonder if there is a nonprofit that might help her. Even though she is alone as head of her family, her problems have never stopped Golsom from living. She also maintains hope. She believes that one day she might get the surgery that will allow her to participate in society. Although people judge Golsom by her face, she never stopped doing her best and she never judged herself by her defects. Golsom is an example to us all. Photo of Golsom by the author. Golsom is indeed an inspirational person who has not given up despite being ostracized by many in the community for her deformity. Life must be so difficult for her. I hope her children are proud of all she has done and continues to do for them. And I hope that this story will attract the attention of people who can reach out to her and help her get the surgery she needs. Thank you for telling her story! Thank you for sharing Golsom’s story. She is a mighty survivor of the worst degree of discrimination and hardship. I very much hope that she is able to be connected with the right resources that can help her get the treatment she so rightfully deserves. No human being should ever have to suffer in this way. How can we help her? I would like to contribute to her surgery. How can i do that? What is the cost of surgery she will need, and how can people help contribute, is there a gofundme page? I’d love to contribute to a surgery fund for her. Is there an NGO in the area that could help her? So proud to have worked with you on this story, Areza. You have a beautiful heart. Hopefully we can work together again next year. Golsom is a women of extraordinary strength. I am sure her children appreciate her very much. I hope something more can be done to help Golsom. It is extremely sad to see how people judge others these days. None of us are perfect! I don’t understand why it is so hard for people to accept this. We each have our own imperfections and what makes us who we are is how we choose to deal with them. This statement is used very often, “Beauty is from the inside, not the outside”. It is said many times, but many of us don’t show this by our actions. I hate having to say this again since it is so often stated, but it is 100% true. It is how a person is on the inside that defines them as beautiful or ugly. Not their physical features. We are all made in the image of God. If we truly want our society to grow as a nation, then we need to show others how to love one another. It is such a waste of time to look at outer beauty because none of that accounts for the real person inside. You are in our prayers Golsom. Golsom has not given up no matter what her situation is, which is amazing it shows that people can push through the difficult obstacles in life. People see other differently when they have standing out in a group. Others have no right to judge others because they are standing out in a group. Everyone is equal in the world. She is a hard worker especially with her conditions, losing her husband and taking care of her children. Other women in the community have started to help campaign and raise money for a surgery for Golsom which is very helpful for her. This is amazing because she has fought through the struggle in life. It is extremely sad to see how people judge others these days. None of us are perfect! I don’t understand why it is so hard for people to accept this. We each have our own imperfections, and what makes us who we are is how we choose to deal with them. This statement is used very often, “Beauty is from the inside, not the outside”. It is said many times, but many of us don’t apply this in our actions. I hate having to say this again since it is so often stated, but it is 100% true. It is how a person is on the inside that defines them as beautiful or ugly. Not their physical features. We are all made in the image of God. If we truly want our society to grow as one, then we need to show others how to love one another. It is such a waste of time to look at outer beauty because none of that accounts for the real person inside. Outer beauty fades, but inner beauty will always stay. You are so beautiful and are admired by many for your courage and the way you choose to deal with adversity. The pain and suffering you are going through are seen by God, so remember to always trust in Him. “The Lord also will be a refuge for the oppressed, a refuge in times of trouble” (Psalms 9:9). This is one of my favorite verses in the Bible. I trust in Jesus and whatever struggles you face in life, there is One always with you and One who will always protect you. You are in our prayers, Golsom. Golsom is a young encouraging person who has a steel of heart and fights with people’s misinterpretation. She survives her life fighting against terrible discrimination because of her deformity. She married a man at a young age but she lost him in a accident. Life for Golsom and her children is tough. No matter what her circumstances are, she is still trying to live a normal life. The way people think about a person’s face over their true personality is common in the society. Matter of fact, it always has been like this and we need to fix it. I hope from the bottom of my heart that she is able to get a surgery so she can live a normal women’s life. Thank you for sharing Golsom’s inspirational story to us. When I first scrolled through the list of stories, I was very shocked by the picture of Golsom. Reading the story made me really sad to hear that this facial malformation could have been cured by proper care, but that she did not have access to it. I think it is really admirable that she could endure the beatings from her husband, burden as a mother, and people making fun of her, and I couldn’t help but think about how much physical pain she was constantly in because of her injections. Even after all that happened to her, she remained strong and worked hard to take care of her family. I really hope that she is able to find someone to help her. The story of Golsom has given a shock to me, that lacking of basic health care can cause a serious illness. Even though with her look, and with her husband beating her, she is still passionate for her life. There is an obligation for us to help them, that they have been suffering from disease that can be easily prevented in our society. Also, I was impressed by her toughness, and that she is not stroked by her loss and lose hope. Instead, she stands up and fight against the difficulties she encounters. I hope we can raise money for a surgery, so that she can live a normal life. Alleviating physiological disorders will only be possible if we solve for the underlying problem of economic instability. Golsom’s story helps highlight the lack of resources provided, which in turn led to a deformity. Ensuring the utmost safety of the people should be a country’s top priority; however Afghanistan is not in a position to support people like Golsom. She is strong and understanding and her story will help us highlight the hardships that the Afghani people face on a daily basis. Golsom is one of the many that have to suffer. Creating a GoFundMe page is something that I plan on doing in the future in order to raise money; donating even a few dollars will suffice. I wish Golsom all the best and hope that she gets better. This is such an inspirational story. Some people don’t understand the things that people go through everyday and all the different struggles and this is a reminder that we need to help people move forward in the world. Nobody is perfect in the world. Everyone has disadvantages. The only thing decides a person is happy or not is his mentality. In the story, Golsom has not given up no matter what her situation is. In fact, everyone is equal in the world. Under the same circumstance, an optimistic person will make his life better than the pessimistic one because he is always encouraging himself. On the contrary, the pessimistic person will become more and more negative because he thinks that everything is going to be worse. If a person can choose the right way to face problems, he will find the right way to live. Golsom is a very inspirational person who has never given up hope no matter what the circumstances are. Even though she was discriminated and ostracized her whole life, she has still successfully raised her children by herself and established a sturdy life. This is something that many people should respect and this is an example for others to follow. It is also very sad to see how people treat others with deformities in society today. It is so hard for people to deal with imperfections within others even though we all have our own imperfections at the end of the day. In society, there is no need for judging other people and dehumanizing them just because they look different than others. Stay Strong. Even though I felt sad to see Golsom suffers a lot for her facial malformation and marriage, her bravery and optimistic attitude has surprised me a lot. She never gives up no matter what happen in her life. I know there are a lot more women suffering from discrimination and have to endure a lot in Afghan, or even all over the world. I hope all the people in minority group can get support instead of discrimination from the whole society. I hope Golsom and everyone who lives in a life like her can always stay strong. I hope every woman in the world can have the rights to make decisions for their own life.